What is the single best predictor of Sales Success? According to George Dudley and Shannon Goodson, authors of the Psychology of Sales Call Reluctance, prospecting is the single best predictor of Sales Success. Sales models are changing and companies are spending big marketing bucks and generating the warm leads for their salespeople. That is terrific for them! However, there are still large companies, banks, mid-market companies and small businesses, that expect their salespeople to be fully functioning and to generate their own leads. 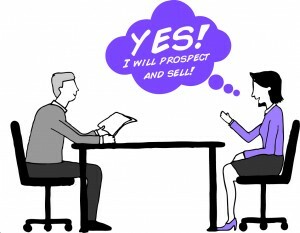 How do you know your sales candidate can and will prospect? Highly recommend you require proof of past performance by requesting a copy of W-2 from the last couple of years. Yes, this is legal! Also, invest in the SPQ Gold that will tell you whether your candidates have the motivation, goal level and the emotional capacity to prospect! Call Connie Kadansky at 602-997-1101 or email connie@exceptionalsales.com today to assess your sales candidates. Previous Previous post: Who is your next sales producer?